I am an emotional wreck right now. Just when I am getting over trading away Isaiah, he goes and does something like this and pulls me back in. Isaiah has been pretty quiet about the trade ever since it broke. Sure there were a social media like here and there, but it has pretty much been nothing coming out from Isaiah, until last night. Isaiah posted this teaser of his new offseason documentary ‘Book Of Isaiah 2’ coming out soon. And then, today, he drops this amazing, heartfelt, honest article that tugged at to many emotions. Isaiah loved Boston. He fell in love with this city and this fan base. He wanted to become a Celtic legend. Like he said, he wanted to be Tom Brady. He wanted to be David Ortiz. He wanted to be the guy who was drafted low, who had a chip on his shoulder, who worked and worked and turned himself into a great player. Someone who would bring a championship to this city. He wanted to be Paul Pierce. He wanted to be Larry Bird. And I am not saying that he was on pace to be any of these guys, but he was the man on a historic team that was building something. And you wanna know what, he is the reason why the Celtics were building something. When Isaiah was traded to Boston, they were thinking about the lottery. Isaiah’s heart and play forced the Celtics start thinking about the Playoffs instead of ping pong balls. Isaiah willed this team into the 1st seed in the East that they were last season. He was the heart and soul of this team and put the Celtics on his back. 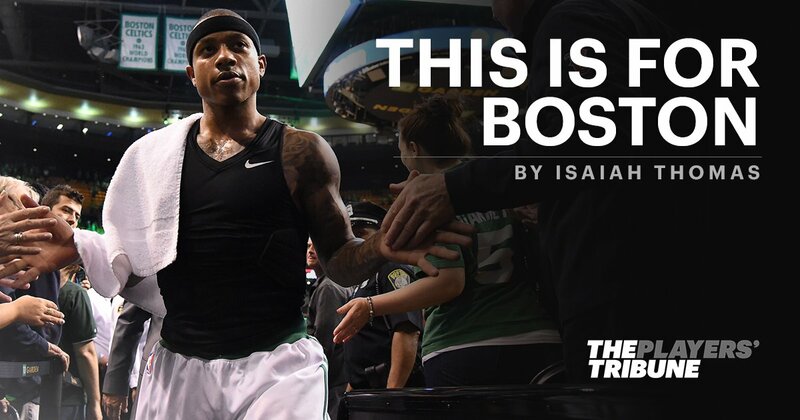 Isaiah embraced being a Celtic. He wanted to be here long term. He wanted to see this to the end. However, this is a business and he understands that. I will agree with him though, I don’t think the Celtics are better this season after this trade. I am going to miss watching Isaiah Thomas play each game like it is Game 7. I am going to miss the true killah that Isaiah is on the parquet floor every night. I wish Isaiah the best in his career and I do hope he gets his brinks truck. This man has taken the Boston Celtics back to where they had hoped they would be and that is competing for championships. I will miss you Isaiah. Thank you for everything you have given us.